Holy Guacamole! | That Yum Factor! What I love about this place is the ambiance. The space is both rustic and festive with it’s dark lighting and colorful Mexican decor. Oh, and can I mention the guacamole? I’d recommend the Trio so you can choose three to try. 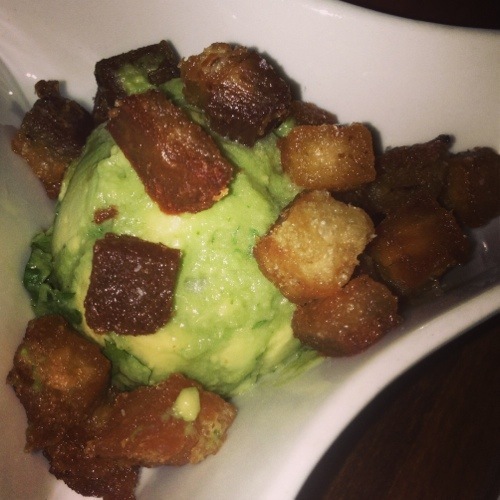 The one pictured above is the crispy braised pork belly guacamole. Fried pork with Guac? Yes please! As a side note, I’ve also tried various tacos, but I prefer their chicken and cheese quesadillas. Posted in Hudson County - NJ, Image format and tagged Jersey City on May 9, 2014 by thatyumfactor.